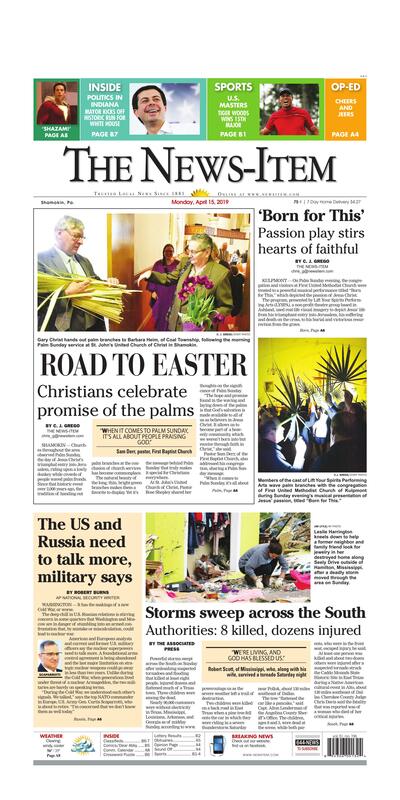 SHAMOKIN — Churches throughout the area observed Palm Sunday, the day of Jesus Christ’s triumphal entry into Jerusalem, riding upon a lowly donkey while crowds of people waved palm fronds. Since that historic event over 2,000 years ago, the tradition of handing out palm branches at the conclusion of church services has become commonplace. The natural beauty of the long, thin, bright-green branches makes them a favorite to display. Yet it’s the message behind Palm Sunday that truly makes it special for Christians everywhere. At St. John’s United Church of Christ, Pastor Rose Shepley shared her thoughts on the significance of Palm Sunday. “The hope and promise found in the waving and laying down of the palms is that God’s salvation is made available to all of us as believers in Jesus Christ. It allows us to become part of a heavenly community, which we weren’t born into but receive through faith in Christ,” she said. Pastor Sam Derr, of the First Baptist Church, also addressed his congregation, sharing a Palm Sunday message. Derr went on to share what he called the four great qualities of the donkey that carried Christ on its back on the first Palm Sunday. “It was resigned, reserved, resistless and resolved,” he said. “In God’s eyes, we must be resigned to the fact that we’re all sinners, in need of a Savior. As believers in, and followers of, Christ, we learn that we’re reserved for God’s purpose and plan for each one of our lives. “We must not be stubborn but resistless, willing to follow after the Lord. Finally, we must be resolved to do whatever it is that God calls us to do, whenever he wants,” Derr added. Leslie Harrington kneels down to help a former neighbor and family friend look for jewelry in her destroyed home along Seely Drive outside of Hamilton, Mississippi, after a deadly storm moved through the area on Sunday. The forecast of severe weather forced officials at the Masters in Augusta, Georgia, to start the final round of the tournament early on Sunday in order to finish in mid afternoon before it began raining. Members of the Lift Your Spirits Performing Arts chorus sing to the congregation at First United Methodist Church of Kulpmont during the opening of “Born for This,” a musical passion play depicting Jesus’ life from Palm Sunday to the grave and beyond. The Lift Your Spirits Performing Arts trio of, from left, Mary Snyder, Leah Briggs and Carl Altman, sing a hymn during the opening of the musical passion play “Born for This” held Sunday evening at the Kulpmont United Methodist Church. KULPMONT — On Palm Sunday evening, the congregation and visitors at First United Methodist Church were treated to a powerful musical performance titled “Born for This,” which depicted the passion of Jesus Christ. The program, presented by Lift Your Spirits Performing Arts (LYSPA), a non-profit theatre group based in Ashland, used real-life visual imagery to depict Jesus’ life from his triumphant entry into Jerusalem, his suffering and death on the cross, to his burial and victorious resurrection from the grave. “We are honored to be the only group in the United States performing this musical production, which was written by CJM Music, based in the United Kingdom. “Through powerful music and narration, this program leads us from Palm Sunday to Easter Sunday, while the cast helps everyone experience the road in a way that few can imagine,” he said. Thomas said “Born for This” is a great way to kick off the Holy Week. “It’s a wonderful time for the family to come and spend together with us as they get to place themselves in Jerusalem and experience being part of the Palm Sunday celebration, the Last Supper, Jesus’ betrayal, his unjust condemnation, crucifixion and resurrection. It will also help everyone to understand how our own sins drive nails into him, mock him and betray him,” he said. Prior to the opening of the program, Pastor Julian Milewski prayed and addressed the crowd of several hundred who packed into his small church, located at the corner of Ninth and Spruce Streets, on a rainy Sunday evening. “Welcome my friends to Kulpmont United Methodist Church. When I first heard these people perform, some time ago, I was moved by their ability to portray the gospel message in a very special way and I know you will be too,” he said. Thomas, who also led the music, encouraged audience participation throughout the evening. “Are you happy to be here tonight? I want us all to sing like we are,” Thomas said. In this Feb. 16, 2019, file photo, Mayor Pete Buttigieg, of South Bend, Indiana, smiles as he listens to a question during a stop Feb. 16 in Raymond, New Hampshire.